230g Fresh Black Dates (seeds removed) - KTPH health tip: good source of iron content! 3 tablespoons Ovaltine Powder - KTPH health tip: most malted drinks are fortified with iron. This is an easy means to incorporate iron in the dish. 1) Combine baking soda, boiling water, and the dates and let it soften for 15 minutes. 2) Blend into a puree and let it cool down. Meanwhile, pre-heat the oven to 180oC. 3) In a standing mixer, cream the butter and sugar using the paddle attachment until you get a smooth mixture. 4) Add in the eggs, one at a time, each time beating well until you get a smooth batter. 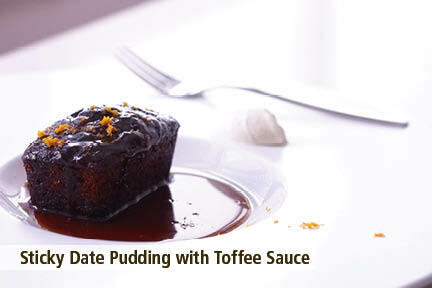 5) Add in the date puree and yoghurt and mix well. 6) Sieve in the flour, salt, mixed spice and Ovaltine. Fold it carefully into the mixture until just incorporated. 7) Pour the mixture into a well-oiled baking pan and bake until the center is cooked through, about 45 minutes. To check, use a toothpick and poke the center of the cake. If it comes out dry, the cake is ready. 8) Meanwhile, place all the toffee sauce ingredients in a saucepan over medium heat. Once it starts to boil, turn down the heat and simmer for about 15 minutes. 9) When the cake is done, poke some holes using a toothpick and pour some toffee sauce over the cake to glaze it. 10) To serve, pour extra toffee sauce over the cake slices and garnish with some orange zest, whipped cream, or even a scoop of vanilla ice cream. ½ cup Anchovies (Baby Ikan Bilis) - KTPH health tip: excellent source of iron! 1) In a large wok, heat up some oil and fry the anchovies until crispy. 2) Remove from wok and set aside. 3) Using the same oil, fry the beancurd slices until crispy on both sides. 4) Remove from wok and arrange on plate. 5) Pour away any excess oil in the wok and add the chicken stock. Bring to a boil and season with the soy sauce, sesame oil and Chinese wine. 6) Add in the red spinach and cover with a lid for about a minute. 7) Add 1 tablespoon of cold water to the cornstarch to make a slurry. Once the spinach is cooked through and withered, thicken with the slurry. 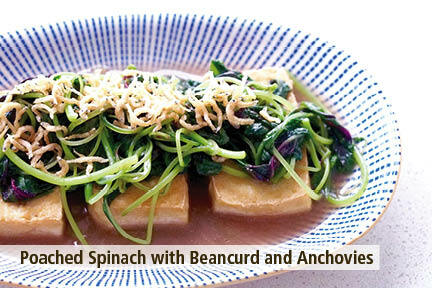 8) Spoon spinach and sauce over the beancurd slices and garnish with the fried anchovies.